Silence-Light is the first release of the flamenco percussionist and composer Nacho Arimany. World-Flamenco Septet is the way to explore the different influences that comes through him, to offer an experience of sharing and flowing with the musicians he has around inspiring him. The great creativity and power of Javier Vercher in saxophones and percussions atmospheres, Lionel Loueke on amazing guitars that comes from Africa to others galaxies, joined with his personal and unique voice, Pablo Suarez supporting with the piano the flamenco harmony going further his own gipsy soul, the great voice and talent of the flamenco gipsy singer Antonio Campos, the superb jazz bass sound of Massimo Biocalti, which works in real union with the flamenco dancer Concha Jareño who gives new percussive melodies and feelings to the music, recording all together live at Systems Two Studio in New York during the spring 2006. This is a Trip around different worlds and feelings. The real compromise with Music as an experience to share in freedom. Always looking for the Sound,doesnt matter the note; just the sound of (the) Cosmos and the beauty of it movements. 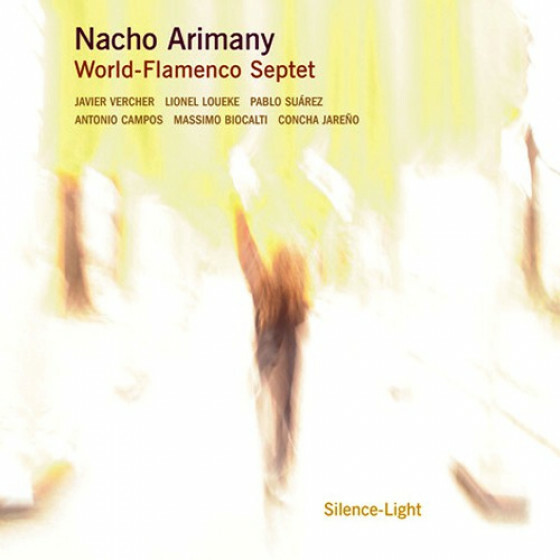 "The mysterious and beautiful art-form of Spanish Flamenco music is re-interpreted in composer / percussionist Nacho Arimanys, Silence-Light, a unique listening experience that features the Madrilenian and his World-Flamenco Septet. The genre has been covered before within various idioms, and while the sounds are familiar (precision handclapping and foot-stamping) there is more than what is heard as Arimany states that The music isnt an esthetic end, but rather a channel to generate movement or communication. This is articulated by Arimanys inspired performance and direction of exceptional musicians representing the fundamental links of Flamenco music including guitar, vocals (featuring Antonio Campos), and dancing (performed by Concha Jareno). Add well-crafted contributions by bassist Massimo Biocalti, pianist Pablo Suarez, and rising jazz/world playersguitarist Lionel Loueke, and saxophonist Javier Vercherand the result is a mesmerizing project. The music indulges many sounds and influences including spirituality, folk, dance, and poetic forms that smoothly flow between each other. This is most evident on larger pieces like the commencement call of Origen which contains the sounds of percussion, running/splashing water, woodwind instruments, and chant-like voice, all moving into different compositional sections. Recorded live, the recording feels episodic with sections described by instrumental, dance, or vocal movements similar to a live theatrical work. Each member of the septet provides excellent performances. Arimanys passion is heard in his playing, painting each piece with ethnic drum-set (which includes exotic percussion) as well as guitar and voice. Discriminating lines are also drawn by Louekes acoustic or synthesized guitar and West African vocals on 3 Angels mixed with Arimanys percussion to create a peculiar new world sound. Along with Arimany, the intricate workings of Biocaltis bass and Suarezs piano provide more than just a jazz trio foundation but also acts as a conduit between the various changes. Saxophonist Javier Vercher makes his presence felt by adding contour texture and mood in depending upon the moodsometimes primitive (Below The Sea Level) or jazz-oriented (Soleá Del Viento). The spirits of dance and song are always present and Concha Jarenos footwork is an added percussion instrument on Meeting Point, while Antonio Campos remarkable vocals are playful and romantic or haunting on One Old Song.